The Montserrat Arts Council is launching the second event in it’s Ignite series. 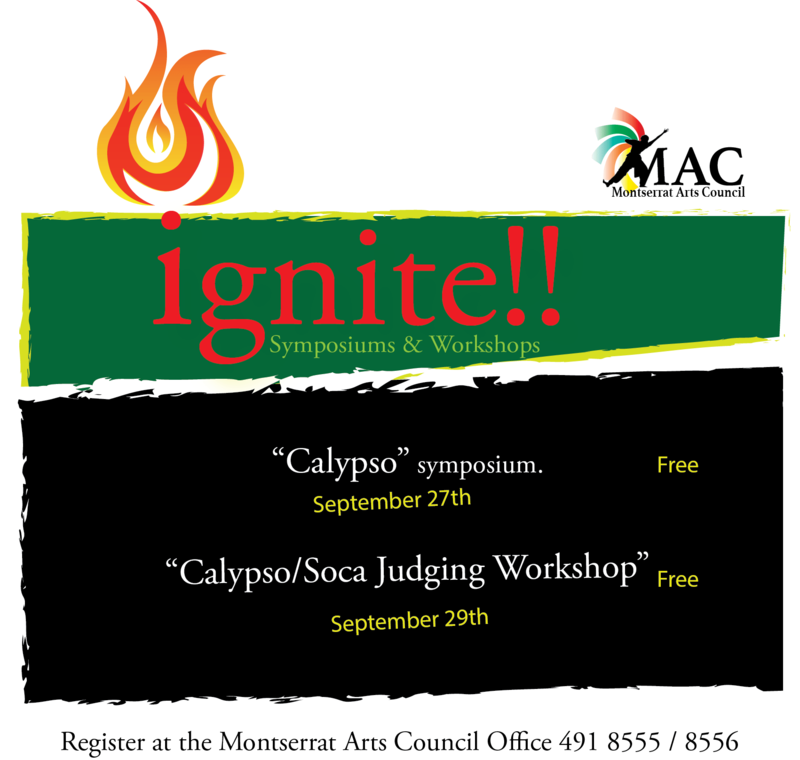 A Calypso Symposium and a Calypso/Soca Judging workshop is scheduled for Thursday, September 27 and 29th. “This we hope, is the beginning of a broader conversation on both calypso writing and producing,” said MAC Outreach Officer Sharlene Lindsay. Due to the loss of resource persons and practitioners as a result of the volcanic crisis, the Ignite series intends to serve as an ignition point to rekindle interest in some of the cultural items that have been pointed out as needing assistance. Earlier this year, we covered areas in Business of the Arts and Event Management; we are now looking at Calypso/Soca (Judging and Producing). Dance, Film and Literature are some of the other areas which will eventually be covered. These areas, as far as possible will be facilitated by top practitioners, local and regional, in each discipline. The Calypso symposium will take place on Thursday September 27 at 6pm at the Montserrat National Trust. This will be followed by a workshop in Calypso/Soca Judging on September 29. The workshop will be facilitated by Dexter Asson. He is a seasoned judge and musician working in the area of calypso. Asson is a native of Trinidad and Tobago. “We are indeed grateful to Mr. Dexter Asson for the workshop component of this session, and our local panelists who have agreed to assist with the symposium. We are looking forward to a great turnout to both sessions and hoping that this will be a healthy sharing session. I hope it also inspires some of our younger artists and perhaps lights a fire under a retired calypsonian or two, to come out of retirement and contribute again to our calypso story, as artists, artistes and judges.” expressed Chadd Cumberbatch, Director of the Montserrat Arts Council. Admission to both the symposium and workshop is free of charge. However, everyone is encouraged to contact the Montserrat Arts Council to register for the workshop by calling 491-8555/8556 or sending an email to info@artscouncil.ms.